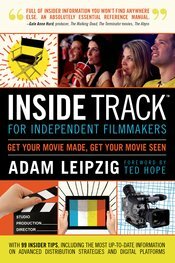 Inside Track for Independent Filmmakers is your roadmap to getting your movie made, seen, and distributed. With 11 Inside Tracks and 99 step-by-step tips, you'll discover insider secrets, step-by-step instructions, and time-saving shortcuts-everything you need to approach financiers, actors, agents, and distributors like a savvy professional. Written in straightforward, everyday language by media expert Adam Leipzig, the past president of National Geographic Films and a former senior executive at Disney, who has supervised more than 25 films. This concise volume tells you exactly what you need to do to get your movie made and find the perfect audience. You will learn how to get great casting for your movie; pitch your project to financiers and speak the language they understand; find the evidence to support your creative vision; work the festival circuit like a pro; and make your film incredibly attractive to distributors.